The shape and structure of a building always tell a story. According to architectural theorist Yehuda Safran, what distinguishes architecture from mere construction is the thought and intent that it expresses. The form of buildings around the world, especially in resource poor contexts, reflects the imperative to do the most with the least. “Less is more,” Mies van der Rohe’s famous architectural maxim, has served as the guiding principle of the international style throughout the 20th century. The idea was that the essence of a building would be better expressed by stripping it of all flourishes. Incidentally, the reduction of buildings to their core functions is the underlying logic in so-called ‘slums’ the world over. A shelter, a workspace, or both merged together—these are the basic needs that can be read in the architecture of the kind of ‘homegrown’ settlements that sprawl in and around South Asian cities. When researcher Shreyasi Dasgupta introduced us with a new type of building she had observed in Dhaka, we were fascinated by the kind of need and intent they revealed. In Dhaka, local builders have recently gone on a rather feverish binge to respond to a seemingly insatiable demand for temporary accommodation that would be at once extremely affordable, centrally located and not stigmatising. They created a stock of small rental apartments in mid-rise buildings that meets the demand of migrants on long cycles of work away from their villages. These structures are modelled on student housing and derive their name from the common place where students would eat together. They are referred to as ‘mess housing’. This specific typology is part of an old lineage of urban housing, for instance, the Mumbai ‘chawls’—workers barracks—or even the ‘kuds’ or clubs of Goan migrants to Mumbai that still exist in the city. 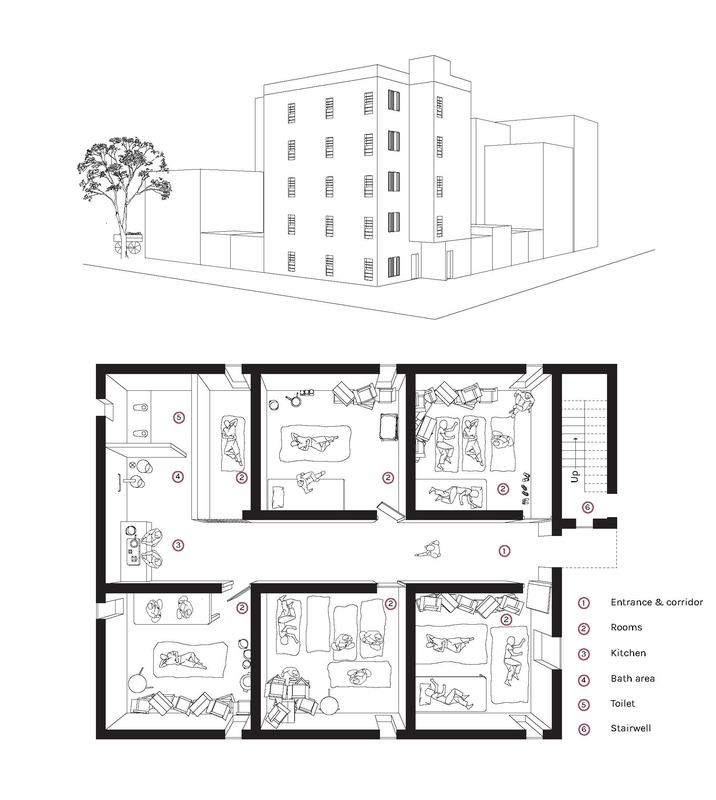 When seen through an even broader lens, the typology can be connected to other forms of temporary accommodation meant for short and long-term visitors to cities. Indeed, mess housing, chawls and kuds share a kinship with hostels, dorms and army barracks with their common toilets and facilities. According to Dasgupta, mess housing is now very much part of Dhaka’s urban fabric and is here to stay. Its arrangements are diverse. They are usually exclusively for male, female or for families. As is typical of South Asian policy, rather than see this emergence as something that is valuable, connected to a real need, or in need of improvement, the story of mess housing in Dhaka parallels the story of slums in India. It grows in the shadows of rules and regulations and thus does not always allow its full potential to emerge. Accommodation and housing are related, but also distinct needs. Recognising this, in a context where migration tends to be connected to circular and seasonal movements of labour between villages and cities, will only create more realistic planning and regulations for cities in South Asia, whether in Dhaka, Kolkata or Delhi. In fact, a large percentage of city-dwellers all over the world do not intend to stay forever—they come for work, leisure, or learning and then move back or move on. This is as true in Mumbai, Berlin as in Seoul and Dhaka. Perhaps, some smart developers and planners will learn from Dhaka and get inspired to produce new types of affordable temporary accommodation that will lower the barriers to entry for hundreds of millions of migrants who otherwise—wherever they may be in the world—typically have to choose between living in a slum or a basement near the city centre or a flat in the far-out periphery.